At a glance | Gurgaon | Tourism Hubs | Haryana Tourism Corporation Limited. The city was named after revered teacher Dronacharya of epic Mahabharata. It is believed that Dronacharya was gifted this ancestral village by his disciples, the Pandavas and Kauravas. He gave spiritual instructions to them at this place. Today the same place is marked with development, modern facilities and a planned infrastructure. The public-private sector partnership model in real estate development has been the major force behind Gurugram's emergence as the corporate capital. Its close proximity to the National Capital Region has also resulted in Gurugram becoming a corporate hub of BPO companies, IT companies, etc. in an uptrend in the hospitality industry here, with MICE tourism being the major driving force. Apart from being a city with throbbing commercial activities, Gurugram is also blessed with quite a few tourist destinations that are worth exploring. Location: The present Gurugram district comprises nine blocks: Tauru, Nuh, Pataudi, Nagina, Punhana, F.P.Jhirka, Sohna, Gurugram & Farrukhnagar. It is the southern-most district of Haryana. The district lies between 27° 39' and 28° 32' 25" latitude, and 76° 39' 30"and 77° 20' 45" longitude. On the North, it is bounded by district of Rohtak and Delhi. Faridabad district lies to its east. 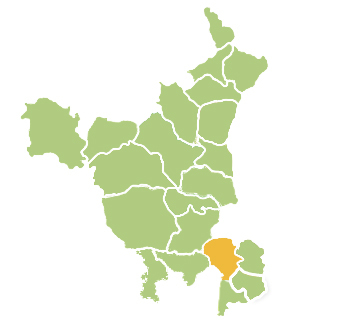 On its South, the district shares boundaries with the states of Uttar Pradesh and Rajasthan. To its West lies the district of Rewari and the state of Rajasthan. Linking Roads: Gurugram is located right on the National Highway No. 8 accessible by the linking road from Delhi-Jaipur Express Highway, 30 km from National capital falls under NCR. Postal Code: 122001 | Longitude: 77° 04' E | Latitude: 28° 37' N | Area: 2760 sq. km | Altitude: 229 metres | Population: 1,514,085 (Census 2011) | Literacy Rate: 84.40 | STD Code: 0124 | Villages: 291 | Language: Hindi, English | Best season to visit: All seasons to visit. The nearest airport is Indira Gandhi International Airport (IGI) at New Delhi, which is about 15 km from Gurugram. Located at the western end of the old city, the Gurugram Railway Station connects Rewari in the South and Delhi Cantt in the North. Some of the important trains that start or pass through this junction are Ajmer Shatabadi, Jammu-Ajmer Express, Mandor Express and Alla Hazrat Express. An eight-lane expressway between New Delhi and Gurugram connects the National Highway No. 8 and is a vital connecting link between Delhi-Jaipur-Mumbai. There are direct bus services to Delhi, Alwar and Chandigarh as well as to Uttar Pradesh, Jammu and Kashmir.